Join AIIM in conversations about ECM, InfoChaos, SharePoint and all things content. How are the spending patterns for Content Services changing and evolving? This is part 3 of a four-part series based on our new State of the Industry – Content Services market research study. Part 1 -- What exactly is the link between IIM and Digital Transformation? Part 2 -- What kinds of critical business problems are users trying to solve with Content Services? Part 3 -- How is content services automation revolutionizing records management and information governance? Multi-channel next-generation information capture is clearly the least mature of the four core Content Services technologies. Multi-channel capture is poised to assume an increasingly important role as the tide of incoming information rises and accelerates. There is still a long tail in the market that views “capture” as primarily something you do to paper in order to more effectively store it somewhere. That is clearly changing, and next-generation capture is focused on the capture of information from all forms of incoming information, translating that information into a machine comprehensible form and using it to directly engage business processes. 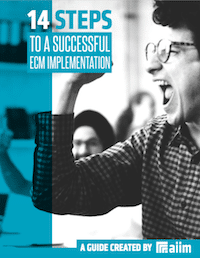 Making an ECM implementation successful requires planning and attention to detail. The best way to create the right solution is to identify organizational goals and priorities. Learn how to manage a successful implementation in our free guide. How is content services automation revolutionizing records management and information governance? “Every organization is on — or should be on — a Digital Transformation journey.” I would bet that this isn’t the first time you’ve heard that statement. At AIIM, we really believe in that statement, so we’ve been practically screaming it from mountain tops. What kinds of critical business problems are users trying to solve with Content Services? This is part 2 of a four-part series based on our new State of the Industry – Content Services market research study. Part 1 -- What exactly is the link between IIM and Digital Transformation? The past few years have created many new challenges for the Information Professionals who are entrusted with managing an organization’s digital assets. Information is cascading down upon every organization in unprecedented volumes and forms, challenging traditional and manual concepts of records management and information stewardship. Every organization – regardless of industry – is now a technology organization. But rising information chaos is a very real and strategic threat to the ability of organizations to succeed, or even survive. An effective Content Services strategy is key to addressing these challenges. The proliferation of technologies across the world has led to a global environment of interconnected devices that allow us to communicate with one another constantly. This exponential growth, in essence, is the Internet of Things. It is the chief idea of bringing all of our lives online so that they can be made safer and easier to lead. However, it goes much deeper and further than that. In the next few years, we are anticipating that more than 50 billion devices will be internet enabled thus adding to the Internet of Things (IoT).